Color is an important tool for communicating – within our communities, in nature, and in advertising and marketing. It’s an element of visual language that people process almost immediately. Color ‘jumps out’ at viewers before they even begin to process what they are looking at. 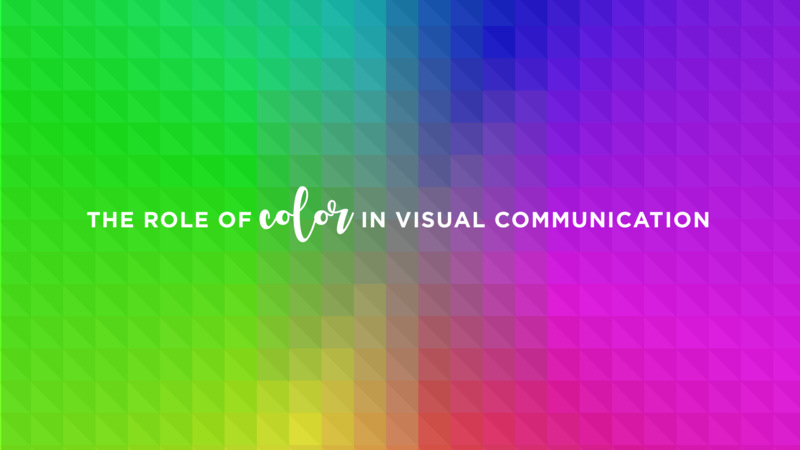 Because of this immediate impact, color plays a large role in how we visually communicate. Portray information quickly. Color can be used to help people find information quickly. For example, while looking at a map or standing at an information kiosk. The right use of color makes it easier to find that “You Are Here” arrow or which stops are along your transit line. Add emphasis. In a design layout, the use of brighter or bolder colors, or a signature color in a single area, is a visual cue that tells viewers’ what to notice first. Organize or give structure. The use of color can give detailed charts or complicated infographics organization, guide the viewer’s eye, and simplify complex information. Improve recognition. Think traffic signs – yellow usually mean caution, green signs give you directions, while blue signs usually provide general information. Convey emotion. We’re all familiar with how certain colors can be used to express emotions or influence moods. There is a definite psychology to color use – blue is stable and trustworthy, yellow is warm and cheerful, green is peaceful and healthy – and the appropriate selection can be used to your advantage when trying to convey a certain message. If you’ve ever wondered how to use color in your own marketing, give us a call at 910.681.054 or send us an email. We’ll be happy to talk color.